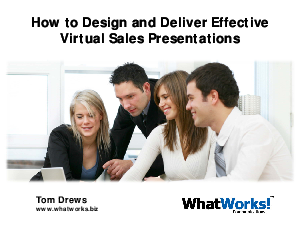 Effectively engaging prospects is one of the greatest challenges you'll encounter with a virtual sales presentation. If you don't hold a prospect's attention, you probably won't make the sale. This new What Works! eBook explores best practices for effectively engaging prospects in a virtual environment to shorten the sales cycle, beat the competition and close more business.